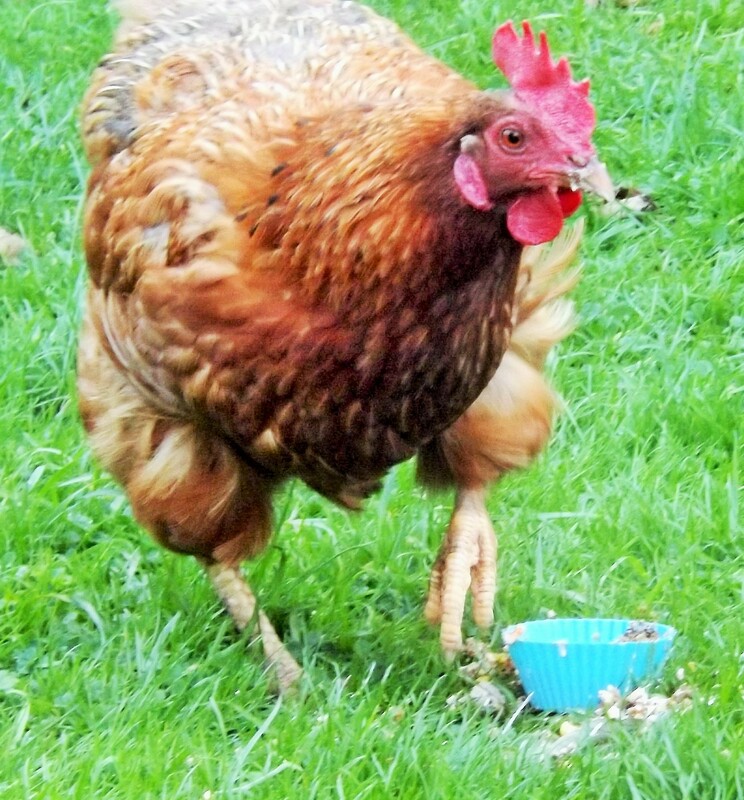 Miss Greta Garbo Chicken has a very important announcement … she is finally wearing knickers!!! Greta, if you remember, is the exbatt with the bootylicous bottom. 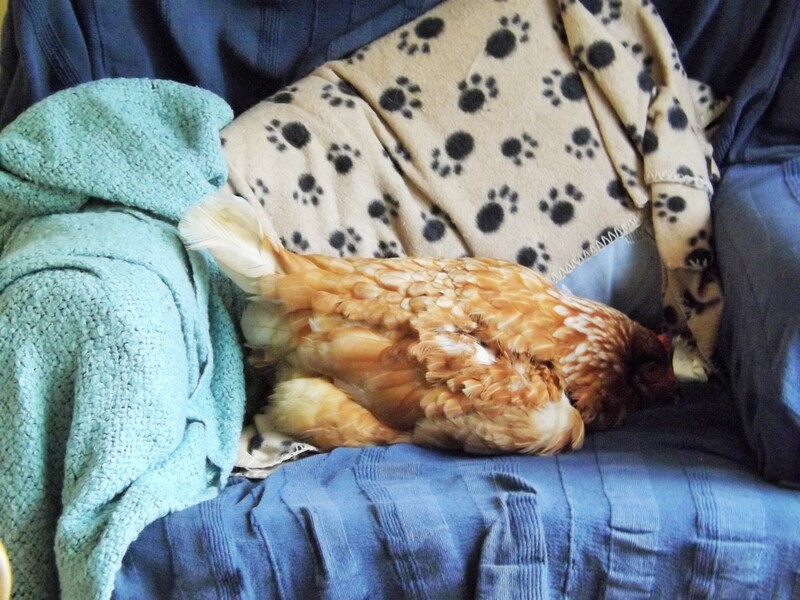 Two-and-a-half years’ free, she has always had a swollen rear end that was completely featherless. 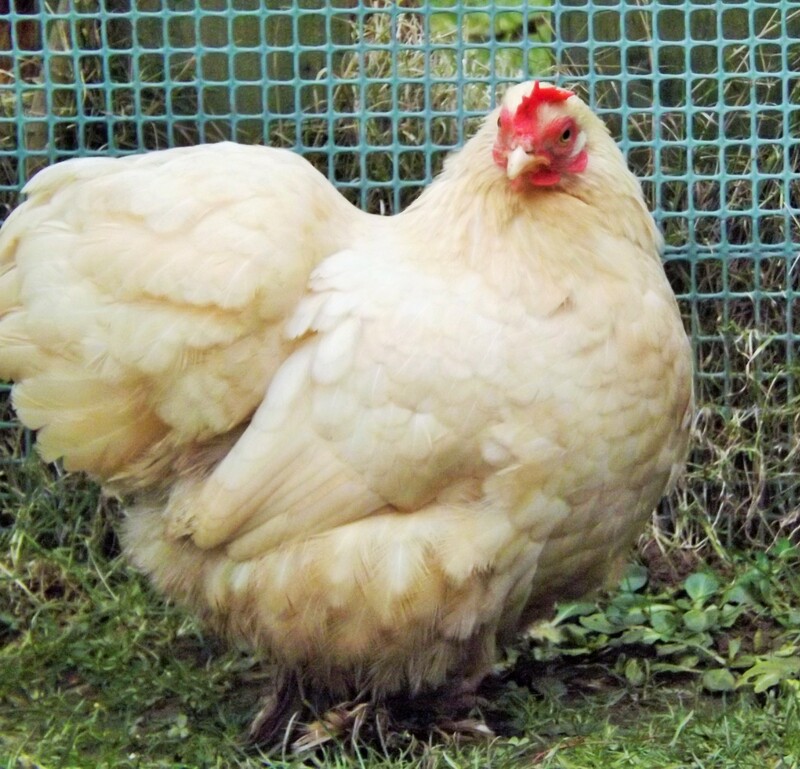 Her big, knickerless bottom never really gave her any issues, she has always been a happy and active girl who loves her food. Occasionally her bottom swelled a little and felt fluidy and she was treated with furosemide and dandelion tea until things settled down. She has had regular check-ups with Uncle Jason but has never had an ill day in her free range life. 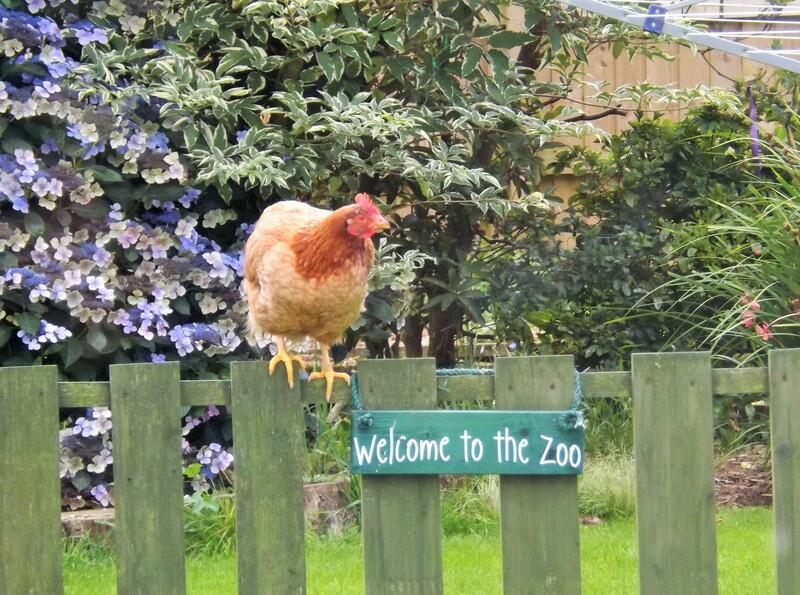 The first sign something was changing was that Greta stopped her usual trick of sitting on eggs in the coop and claiming them as her own. 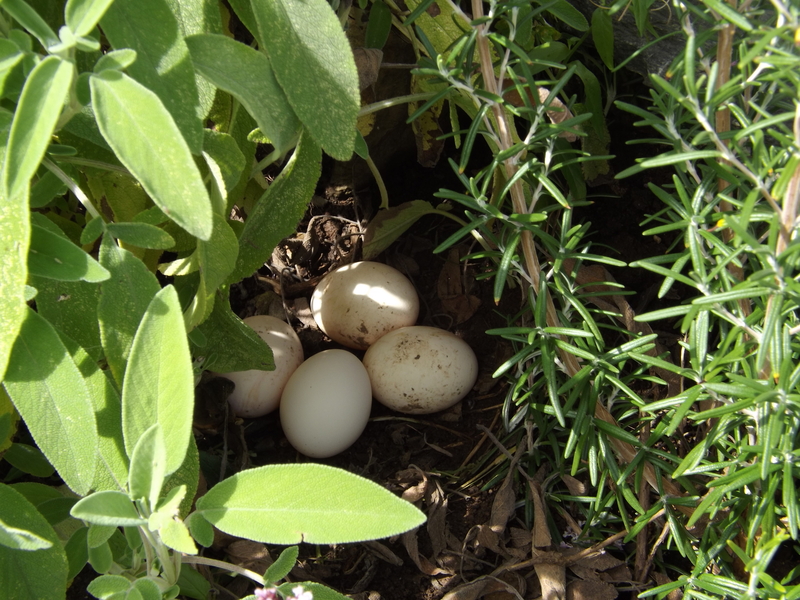 She showed no interest at all in Lupin’s eggs (the only girl laying at the minute)!! Then, over the winter, she started a small moult and something miraculous happened! Not only did her bottom reduce in size, literally, overnight to an almost ‘normal’ size, but she started to grow feathers on it!! They are currently at the paintbrush stage. I have absolutely no idea how this has happened; Jason and I believed her bootylicous area was scar tissue … obviously it was just fluid and for some reason it has gone. Maybe it is linked to her eggy urges stopping, maybe it is something else. Either way, she is looking even more magnificent and beautiful than before and by spring I hope to be able to post a picture of her fully grown, fabulous frilly knickers! 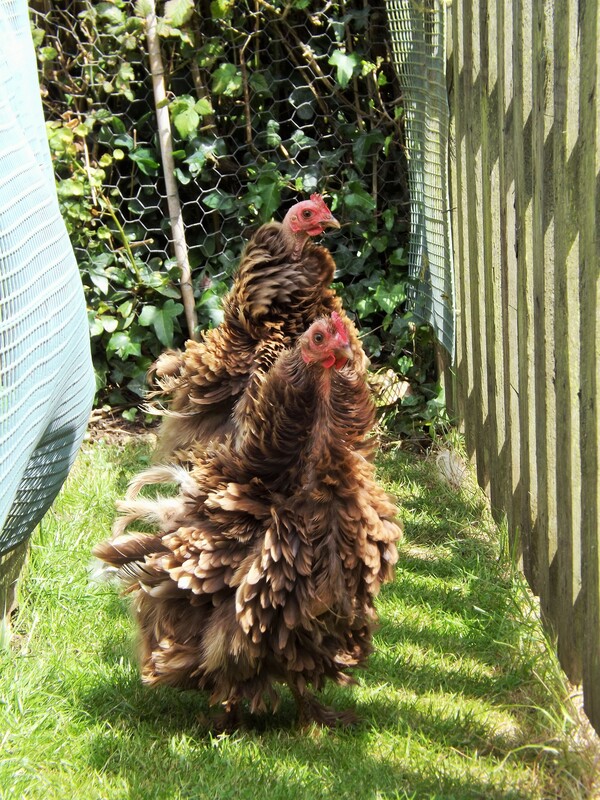 Happy Three Year Henniversary Effie and Flora-Jayne! On Friday 19th December, a very special event was celebrated here at Rosewarne. 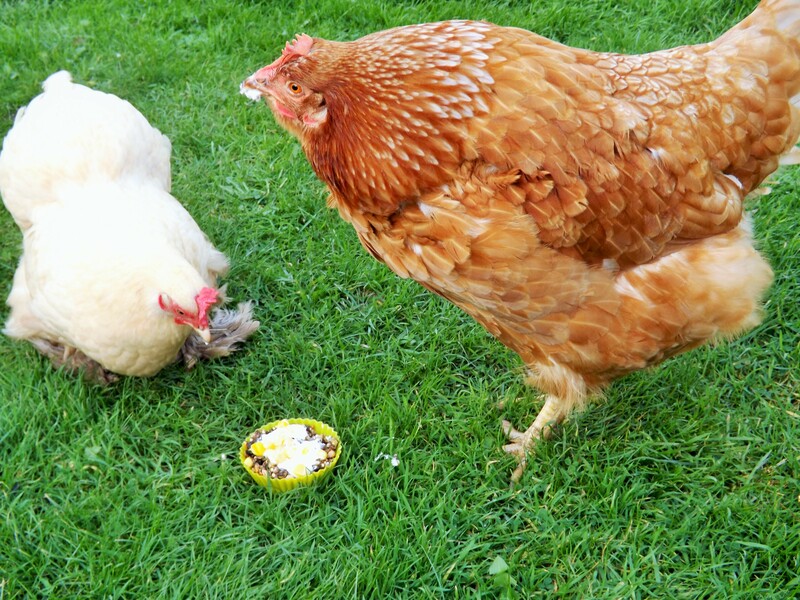 Miss Effie Chicken and Miss Flora-Jayne Chicken celebrated the amazingly brilliant achievement of being free range girls for three years! 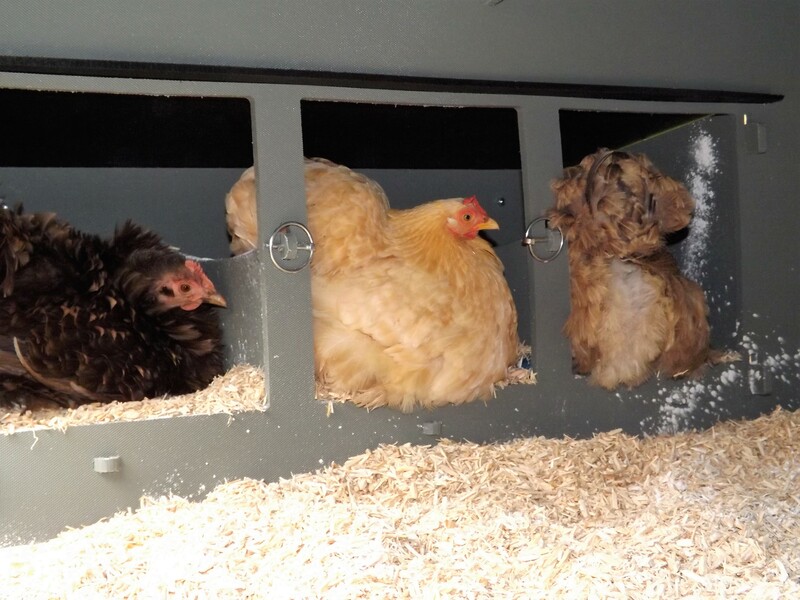 This is no mean feat as ex-battery hens are bred to live for about two years, 18 months of that laying intensively. To survive a year out of the cages is good, two very good and three … well, three is a first for me!! 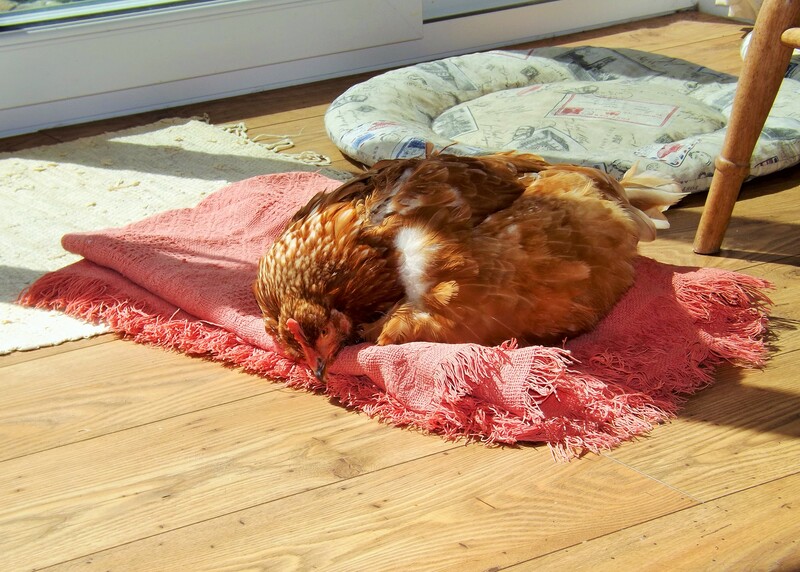 Effie’s story is well documented here in this blog, she came to me a terrified scrap of feathers, injured and traumatised and her rehabilitation took many months. She showed me what cages can do to a hen physically and emotionally and, more importantly, what a brave heart can overcome given love and care. She is my special girl and the three years she has blessed my life has been an absolute privilege. I adore her and am grateful for every day she spends with me. 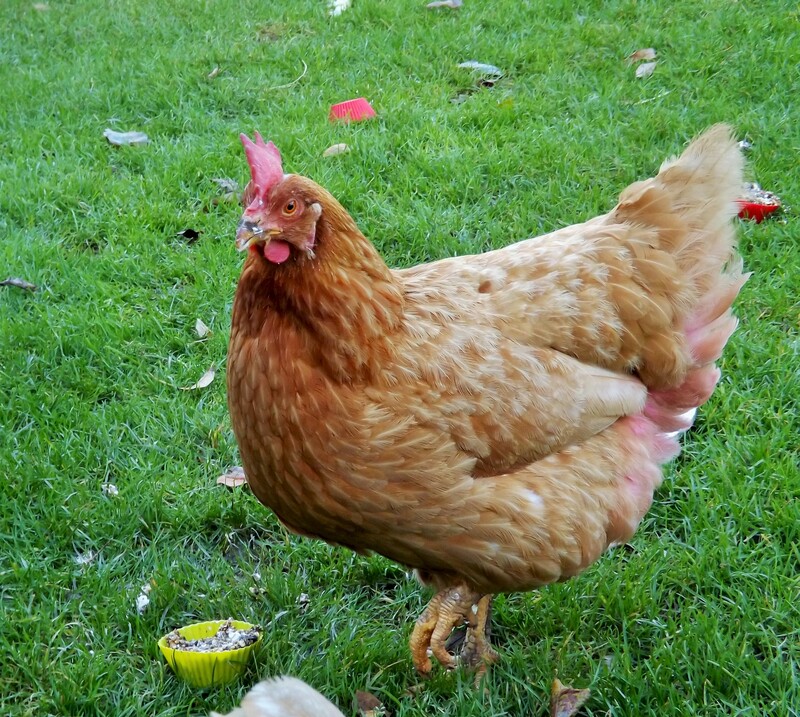 Miss Flora-Jayne, my strawberry blonde showgirl, came to live with us about 18 months ago. She had come from the same rescue as Effie and all of my E girls, but she and her three new sisters had gone to live with two lovely ladies in Helston. However, Flora outlived all of her sisters and was a lonely girl, so she came to live with us. 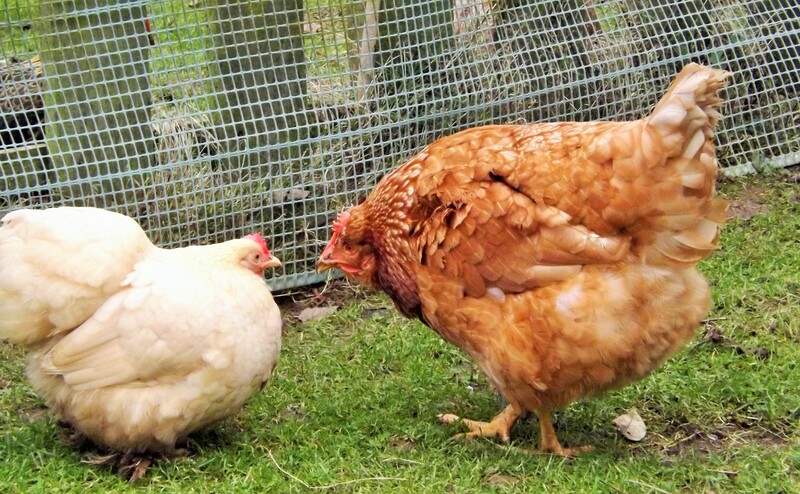 She recognised Eliza immediately and the two hens were mesmerised by each other. It is not so improbable, they came from the same row of cages and could easily have been in the same or neighbouring cages. 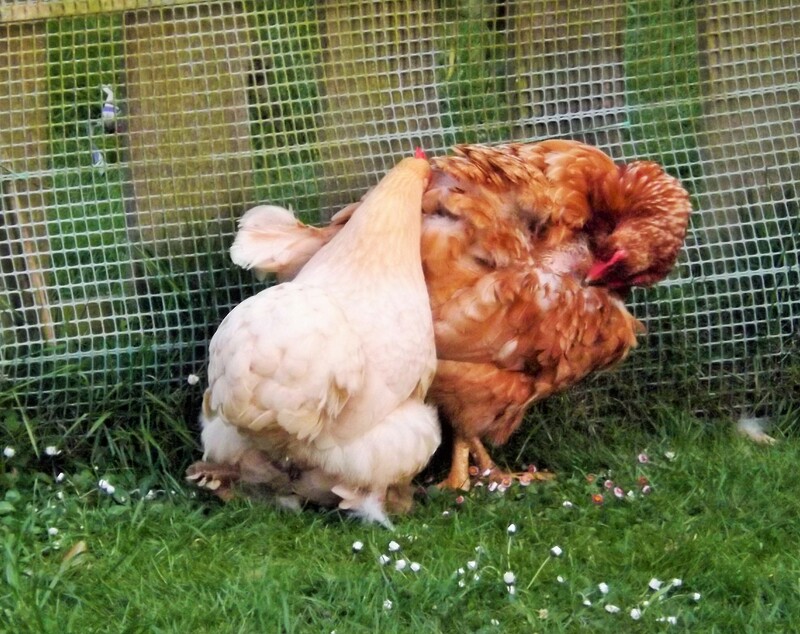 It does go to prove though, that hens recognise other hens and also have excellent memories! 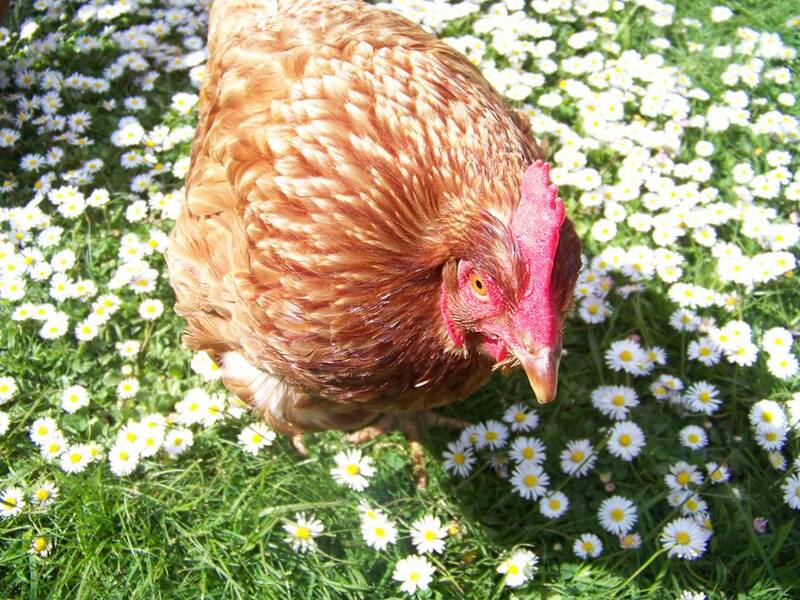 Flora has never had a sick day in her life, she is gorgeous and happy and feathery and an absolute delight to care for!! Before the Big Day, parcels and cards started to arrive for the Henniversary Girls: Numerous tasty morsels from Sarah and Ann, mealworms and personalised cards from Liz, handmade festive treats from Megan and Dawn and mealworms from Quolanta. All were addressed to the hens and invariably ended up at college reception. Luckily the receptionist is aware of the girls and only commented that they were very popular! The night before, Gem brought round a couple of dozen quails’ eggs for the girls’ breakfast, and after cooking, peeling and mashing them, I made bunting and mealworm cakes. We were ready!! 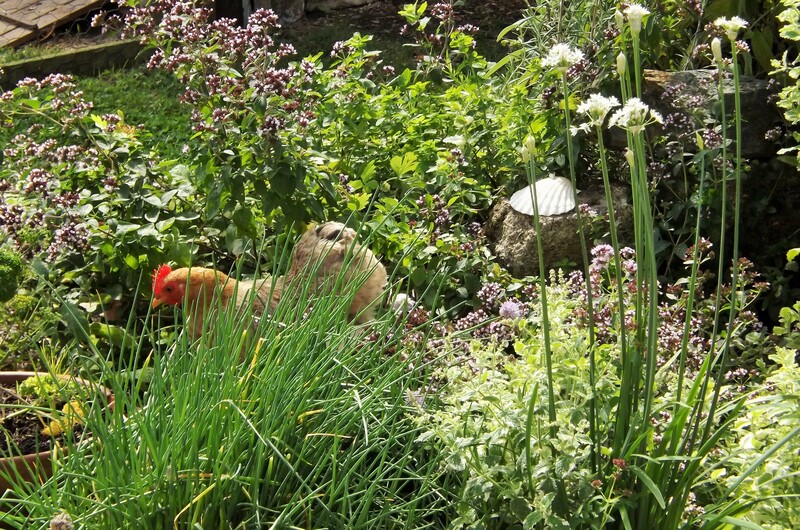 The girls adored their quails’ eggs breakfast and then excitedly headed off for a dustbath and forage. At lunch time the party began in earnest. 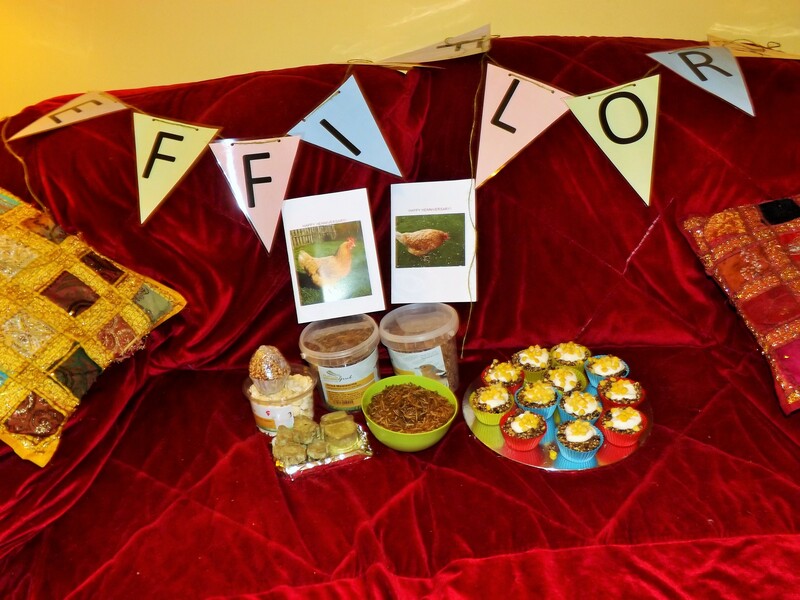 The cakes were devoured in moments and the treats were scattered – Effie and Flora had kindly allowed their gifts to be shared. 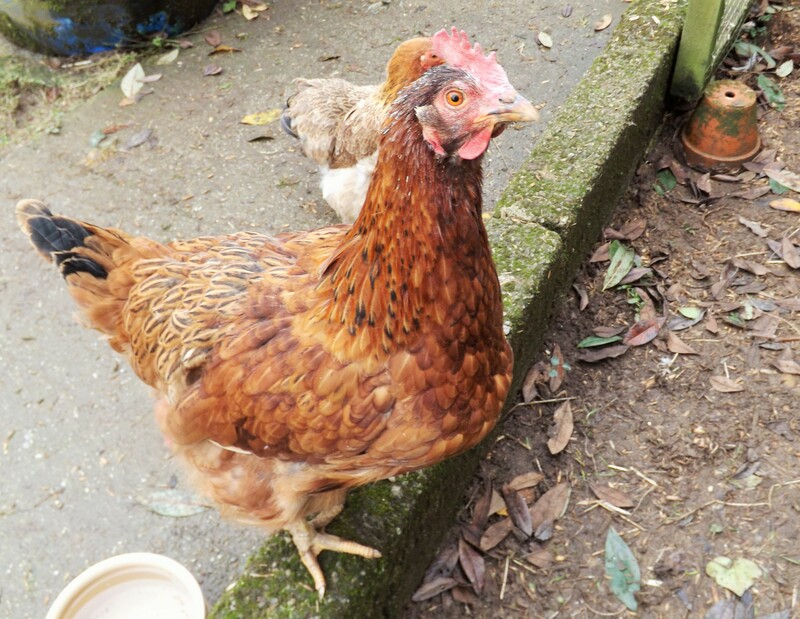 We sung Happy Henniversary and the girls posed for some photos before human friend, Jane, turned up to join in the celebrations*. It wasn’t long before the sun started to set and the exhausted party goers headed happily off to bed, crops full of tasty treats. Effie and BFF Lemony enjoy their cake! In all seriousness I found the day very emotional. Effie means the world to me and the fact that we have managed to get her to enjoy three years as a free range hen is truly amazing. She has overcome so many hurdles, her big, brave heart is an inspiration to me and to the many lovely people who have read about her and love her almost as much as I do. *I can only apologise to the man who was up a ladder painting my neighbour’s house and witnessed the entire thing in absolute amazement! Little Miss Iona Bantam has just given me a terrifying ten minutes. Whilst doing my lunchtime hen check and treats, I assumed she was in the nest box as she didn’t come over for mealworms. But on opening the nestbox I discovered it was empty! Cue a terrible ten minutes when I searched the garden for her. She was nowhere. Panic rising I retraced my steps. What if she had been taken? I have been home all day but we have buzzards here, surely though I would have heard something??? 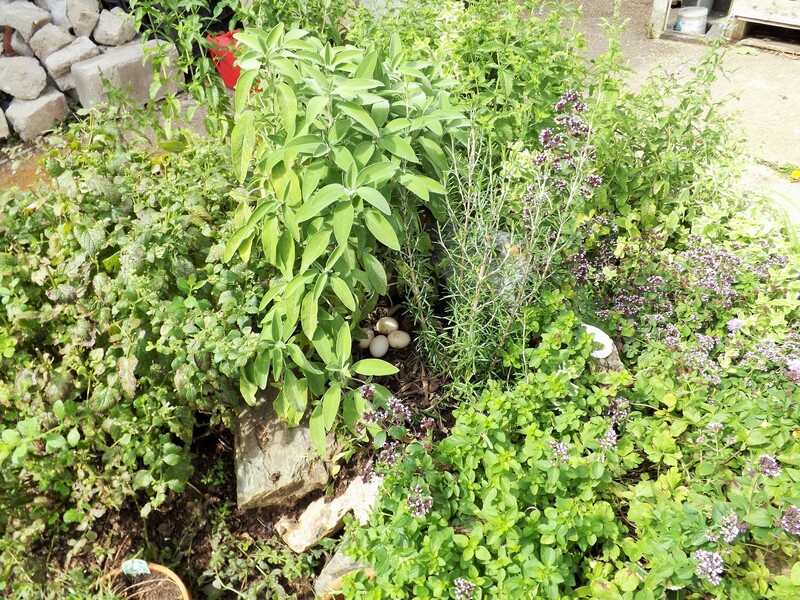 Just as I was about to lose my last few strands of sanity, I found her…happily sitting on a nest of eggs underneath the sage in the herb spiral, chirruping and arranging sticks on her back. Iona happily exploring the herb spiral. I should have guessed! 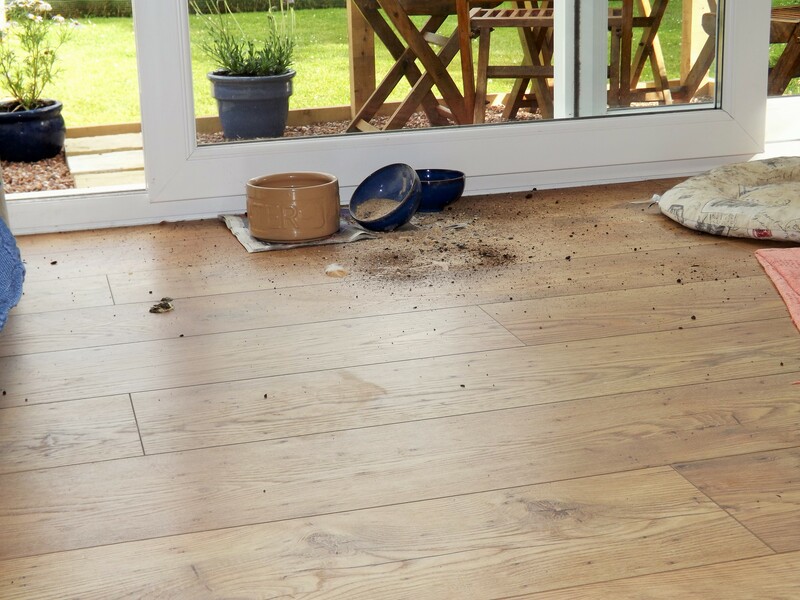 Close up of the crime scene…. Unaware of the horrors she had caused me, Iona happily wandered off, proudly announced her egg’s arrival and proceeded to have a dustbath. Meanwhile, having aged 30 years in ten minutes, I came inside for a sit down and a strong cup of tea! !